After a two year hiatus from working as an executive chef at a San Diego restaurant, the uber-talented Amy DiBiase is back in the kitchen and better than ever, dishing out an innovative coastal menu at downtown's brand new Vistal at the luxurious, bayfront InterContinental Hotel. In September 2016, Chef Amy DiBiase left the kitchen at Paradise Point Resort & Spa's onsite restaurant, Tidal, to join her husband at Grand Restaurant Group - which operates The Ranch at Bandy Canyon and Bellamy's in Escondido and Nick & G's in Rancho Sante Fe. In late 2017, Amy was sent for almost a year on a consulting gig to oversee the revamp of Hula Hulas, a restaurant and bar located within the Grand Naniloa Hotel in Hilo, Hawaii. During her time there, Chef Amy brought the modern Hawaiian restaurant out of the gutters of Yelp's rating system, receiving high praise. We visited Chef Amy while she was consulting at Hula Hulas and enjoyed a most fantastic meal. Although she was not cooking on the line, we tasted and identified her definitive SoCal style. 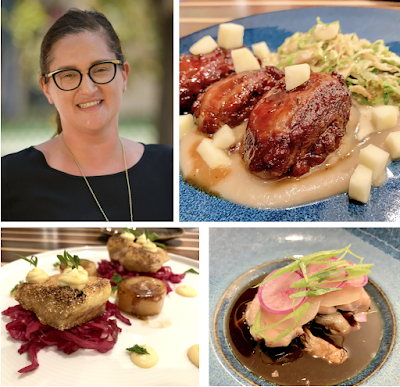 In 2018, Chef Amy came back to San Diego ready to return to the kitchen. She joined esteemed, veteran chef, Paul McCabe, to lead the all-star culinary team at the brand new InterContinental Hotel, which opened last month across from the waterfront Broadway Pier. Amy was specifically tasked with leading the luxury hotel's signature onsite restaurant Vistal, which includes overseeing room service. What’s on your itinerary this weekend? With all of San Diego at our fingertips, we have the world to explore. Vistal was created by DiBiase and McCabe as homage to the seaside communities and diverse cultures that make up San Diego. The menu features an eclectic array of dishes filled with bright, bold flavor combinations influenced by the Baja peninsula, Pacific Islands, Mediterranean fishing villages, and coastal Southern California - with all ingredients locally sourced using sustainable methods. Chef Amy's menu takes taste buds on a global tour. Her pickled black cod dish is absolutely stunning, with Mediterranean flavors remnicent of tzatziki, while at the same time feeling Asian in style. The cornmeal dusted sturgeon is evocative of British fish & chips with a Southern creole, fried catfish vibe. The caramelized cauliflower malfatti is a guanciale stuffed ravioli in an allspice curry, executed with Indian/Jamaican flavor and Italian precision. The Baja stone crab-filled, sheep's milk gnuddi is a remastering of one of our favorites of Chef Amy's classic dishes - a large, cheese filled gnocchi that, in this instance, explodes with briny sea flavor. The coriander cider-braised pork cheeks seem to have a Carolina BBQ influence. Then there is the corn pound cake served with caramel popcorn, honey, corn sauce, mascarpone, macerated figs, and topped with vanilla gelato - a modern American dessert with an obvious nod to Mexico. Chef Amy hits on all marks and does so with graceful humility, making her and her food all the more endearing. Vistal is a beautiful restaurant boasting a lovely perched view of the San Diego bay-front, an expansive patio, and even a private dining room with its own outdoor patio. Reservations are available through OpenTable. Get in there and support one our city's most talented chefs. For more information, visit vistalsd.com.